My first post this month showed the start of a self portrait. Above is the final version, and you can see some of the stages it went through here. 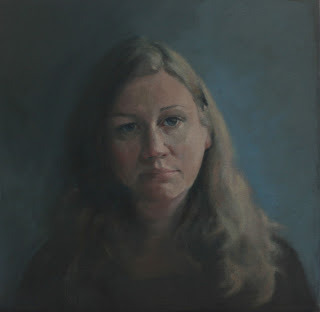 This painting has been pre-selected for The Royal Society of Portrait Painter's annual show, which is delightful. This is the first time I have entered a London show and is all very prestigious and so on. So now the painting is beginning to live its own life. It is currently at the proper photographers and will very soon be at the framers. After that it will be delivered to Picture Post, who for a fee will take it down to London to the Mall Galleries. There it will probably sit against a wall with lots of much better work while the hangers decide which paintings will be in the show, and which won't. At the end of this process it will most likely be picked up by Picture Post and returned to me for another few pounds. If it gets selected, it will be on show in May. It might sell and I will likely never see it again, or even know where it went. If not, back to me. At which point I'll have my painting back and be a few hundred pounds poorer. And then it'll all begin again with the next show . . . Still it is worth it. If I get shown, I will be able to see it on the wall with other painters work, which is always a very interesting thing to see - it tends to really highlight the flaws and gives me clues on how to improve next time. Also, I may be able to meet some other artists whom I have only ever met online, or whom I admire from afar. That will be cool. If not selected I may and go and see the show anyway. The smaller self portrait wasn't pre-selected for the Self show and as the two shows are running together it will be fun to try and guess why they were rejected and therefore do better next year. Best of luck. It's very hard to get something into that show. I tried twice then gave up. Thanks! I am pretty flattered to get this far, so we'll see how it goes. Entering competitions can be a bit of a nightmare though and I think you have to choose the one's that have similar work - I don't think I would enter the Threadneedle, for example.